When it comes to making dinner, fun, I think I’ve hit the jackpot. 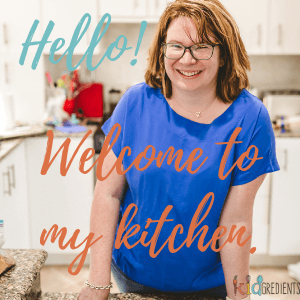 Fun stuff makes the kids eat and if I can make yummy, veggie-filled food…it makes mummy happy! 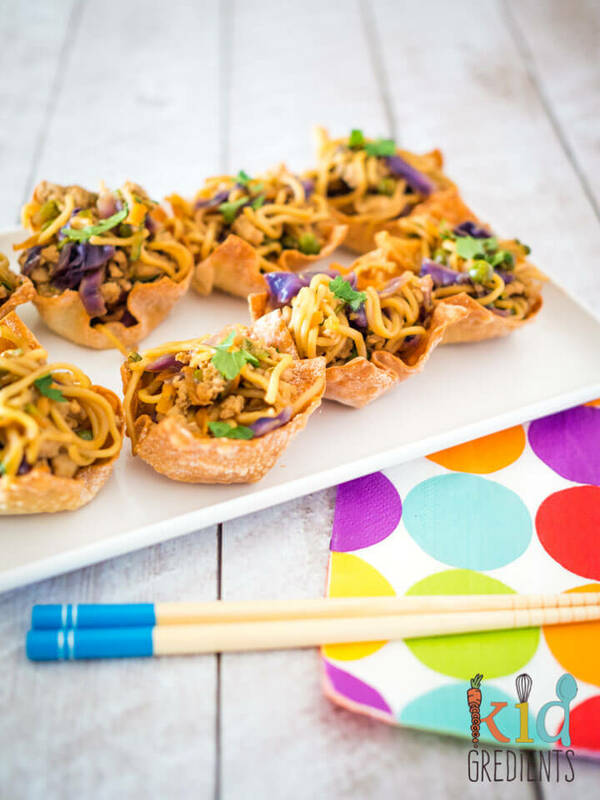 So here we are, delicious chicken and veggie noodle cups in baked wonton cups. 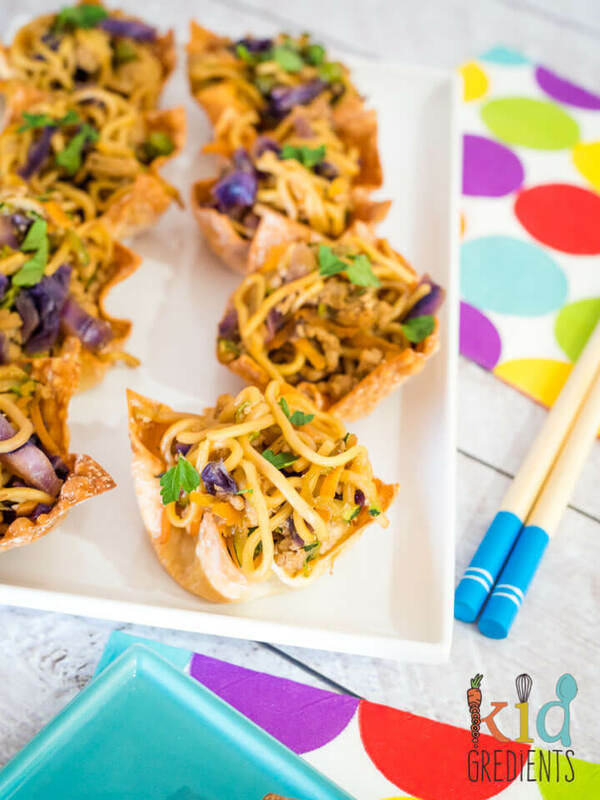 Why bake the wonton cups? Well, it means they are perfect for a picnic dinner in the loungeroom, or for a party snack or for a quick lunch, in fact, they are pretty much delicious for anything. 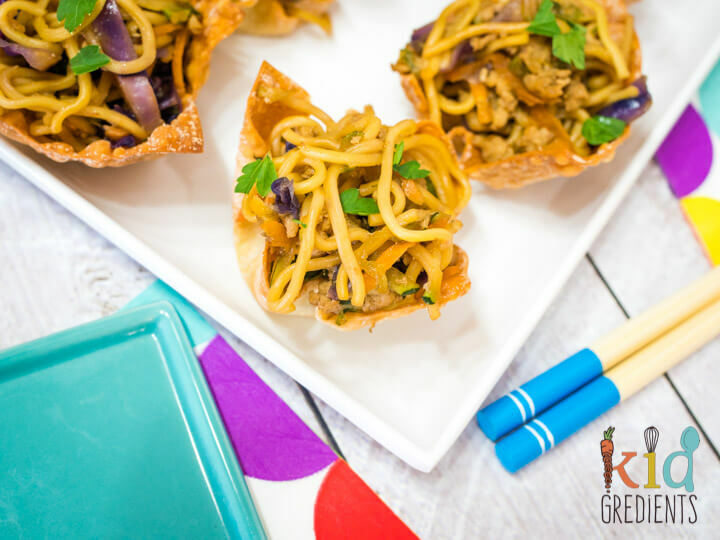 These cups are so much fun, the kids loved filling them and making them and really enjoyed eating them. It was like bringing a bit of restaurant showmanship into the kitchen. I find everything with noodles is great for the kids, it makes something simple even more fun. 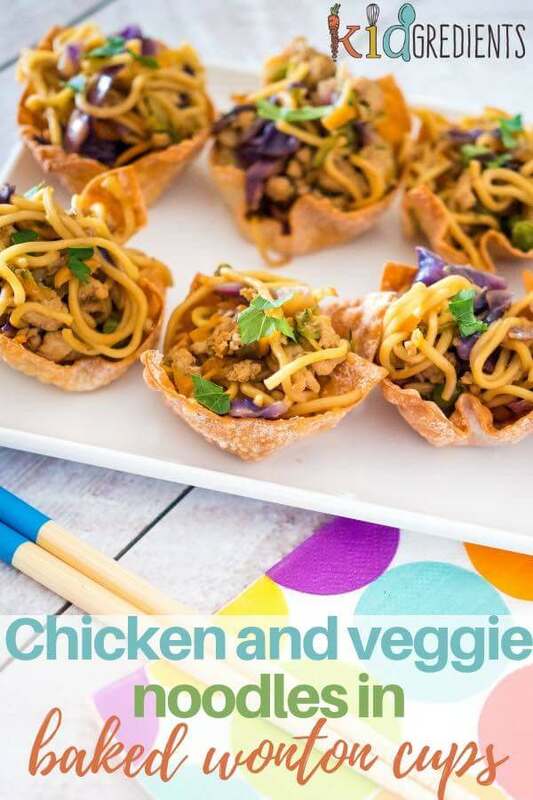 If veggies are difficult to smuggle into your kids’ food, then dishes like this one are perfect for upping the veggie ante. I tell my kids what veggies there are in things now and get them to look for them and find them. The purple cabbage was added because of the colour, but you could swap it for green if you need to hide it better. 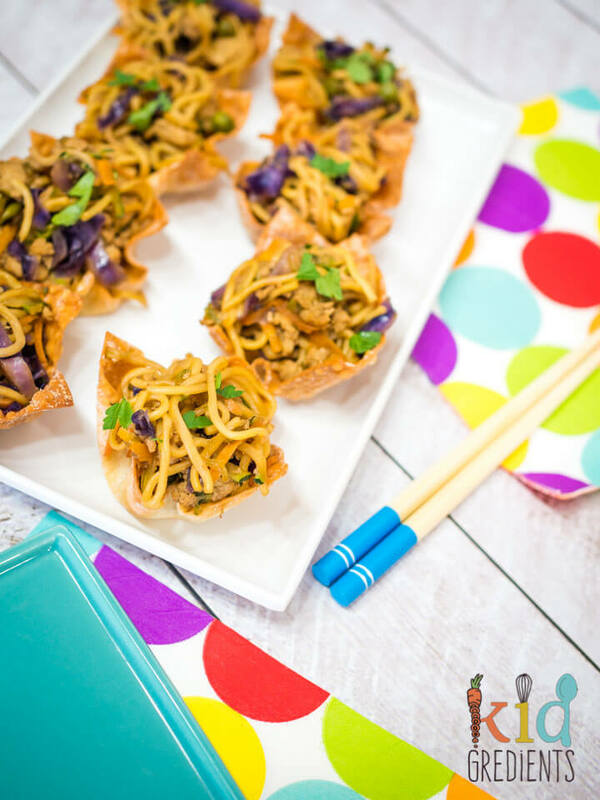 These delicious chicken and veggie noodles in baked wonton cups are sure to be a winner! Kids love them! Easy to make and fun to eat. Bake each batch for 5-7 minutes. Remove from the tray and put on a baking rack. In a wok or large frypan, fry the chicken mince in some spray oil. Prep the noodles as per their packet instructions. Add the cabbage and cook until softened. Add the zucchini, grated carrot and frozen peas. Add the kecap mani and oyster sauce and cook until it bubbles up- 3 minutes. 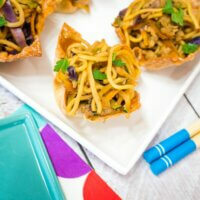 Stir through the coriander and serve in the wonton cups. 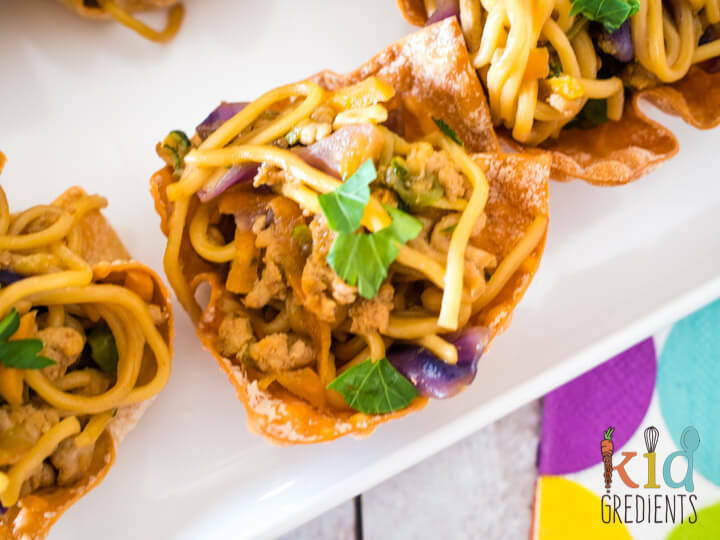 The noodle mixture can be made the day before if you want to serve them cold, or reheat until piping hot and fill the cups. The cups can be made the day before.